Satisfaction from Nature encourages one to stop, have a seat, and take in the beauty of the forest. In framing the real forest, the artist also suggests a framed piece of artwork. Consider how art and nature mirror one another. Both are precious. Both are tangible. Both stimulate a variety of responses that reflect the experience of the viewer. Indulge your creative spirit. Move around so the view you see through the frame changes. Find your perspective and, in it, your work of art. 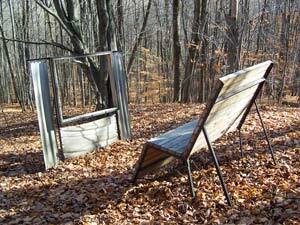 Byung Chan Cha’s other exhibitions include Interlochen’s Annual Art Festival, Matrix Gallery and Dartmouth Hospital. He has also received an honorable mention from the Boston Globe’s Scholastic Arts Awards. As the first student from the Interlochen Arts Academy (IAA) to create a sculpture for the MLAP, this work, created in 2001, represents the partnership between the two institutions, which provides sculpture students experience with professional artists. The MLAP jury reviews each student submission, presented in a formal proposal.